Kudos not to Republican Senators John McCain, Lisa Murkowski and Susan Collins. All heroes of last summer’s vote barring repeal of Obamacare, all seemingly concerned about normative Senate procedures, all at least minimally sensitive to protecting against societal inequities, all caved early this morning to the first step in a GOP strategy to undo The Great Society and The New Deal by voting for the abominable tax bill. Senate Majority Leader Mitch McConnell and Republican colleagues had opposed the 2009 economy-saving $787 billion stimulus plan because it would have increased the federal debt. After Trump’s election, he vowed that any tax cut would have to be revenue neutral. Today, the rush to pass anything that could be called a tax cut regardless of long-term damage to the economy, turns a harsh spotlight on his hypocrisy. We didn’t expect him to do otherwise but thought there might be three Republican Senators who could block him. Only fiscal hawk Tennessee Senator Bob Corker stayed true to his principles, recognizing by his vote that the bill, regardless of scoring method, will never ever pay for itself. Arizona Senator Jeff Flake, who had been heralded for his speech decrying Trumpism, sacrificed his conservative principles and voted for a bill that will, if passed in its current form, would consecrate plutocratic Trumpism, line the President’s pockets and add at least $1 trillion to the national debt. Middle class tax cuts will be puny at best, compared to what will be enjoyed by corporations and the wealthy. And individual cuts expire in 2025, while the corporate cuts will be permanent. And, make no mistake about it, should the Republicans retain control, they will move in the out years to reduce the deficit by cutting the social safety net– including Medicaid, Medicare and Social Security–, essential to the economically pressed devotees of the President. Senate passage was a grab bag of goodies for conservative donors who had threatened to cut off campaign donations to Republicans opposing these sweeping changes. Those donors also won on other aspects of their agenda, including opening up the Arctic Wildlife Refuge to oil drilling, politicizing church pulpits, and stifling college education. In eliminating Obamacare’s individual mandate for insurance coverage, (the Heritage Foundation-inspired basis for Romneycare, which became the model for Obamacare), they opened the door for free riders. And guess who’s going to pay for them when they get sick and have to go to emergency departments? As some 13 million healthy individuals opt out of buying health insurance, premiums will become more expensive for those remaining, another cost of the tax bill. The wheeling and dealing in the wee hours of the morning was unseemly. 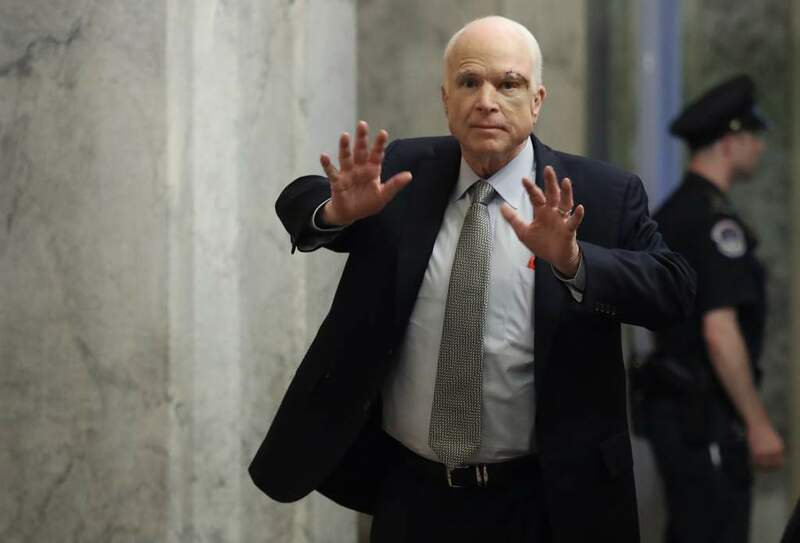 John McCain’s failure to follow up on his own impassioned plea in July for rational discourse and traditional Senate protocols, including bipartisanship, will stain his legacy. Usually thoughtful moderate Collins supposedly signed on after getting Mitch McConnell’s commitment to allow the deductibility of up to $10,000 in state and local taxes. Flake didn’t even get that. His fig leaf for cowardice was a toothless promise by McConnell to give him a seat at the table in DACA negotiations. If whatever emerges from the conference committee does pass, it will take Democrats regaining control of both House and Senate to undo the damage. In the meantime, when will Trump’s base wake up to how he used them and lied to them? Abandon hope, all ye who enter here. This entry was posted in Politics, Uncategorized and tagged $1 trillion addition to debt, Chuck Todd failure, individual mandate, John McCain caves, Lisa Murkowski shame, Meet the Press, middle class tax impact, Mitch McConnell hypocrisy, profiles in cowardice, selling out to corporations, Senate tax bill, Sole GOP no vote Bob Corker, Susan Collins weak. Bookmark the permalink. Brilliant, Margie! You are always on the money. I cannot understand what DT has over the Republicans keeping every one of them from thinking independently and doing what would benefit most of their constituents. Blame also the Supreme Courtâs decision to allow $$$$$$$$$ into the election process . Thanks for your wise words.